Earn up to 43,992 reward points. The last great year in all its authenticity. 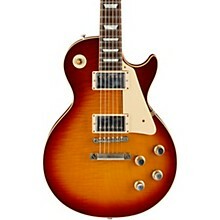 1960 was the last year for the original Les Paul Standard and single-cut Les Pauls in general, as the SG model was lined up to replace them with a more "modernistic" look. This year also saw the adoption of new "reflector" knobs and a new slim neck shape, a perfect profile for the many famous musicians who played '60 Bursts including Eric Clapton, Joe Walsh, and Paul McCartney. Gibson Custom's '60 Les Paul Standard is a painstakingly-accurate replica of the highly-valuable originals rendered in detail so intricate that even the chemical composition of the parts has been scientifically examined and re-engineered-and that's just one small example Sonically, visually, and tactilely, owning a 2018 Gibson Custom Historic Les Paul Standard is as close as one can get to owning a priceless original. Includes hardshell case. All the coveted features are here in amazing detail. Order today.